using the dress front [dart less or front dart] foundation as a guide. Illustration shows blouse with high neckline drape in front. Neckline is 1” lower at shoulder. 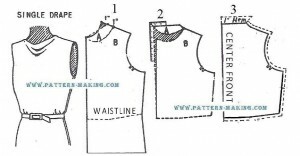 draw a straight line from a point on shoulder seam, 1” below neckline, to center front neck. section A about 1” wide at deepest part of curve. the squared line as illustrated. 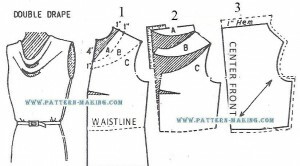 Trace front to waistline only. 3) This diagram shows completed front. Allow seams on all edges but center front. 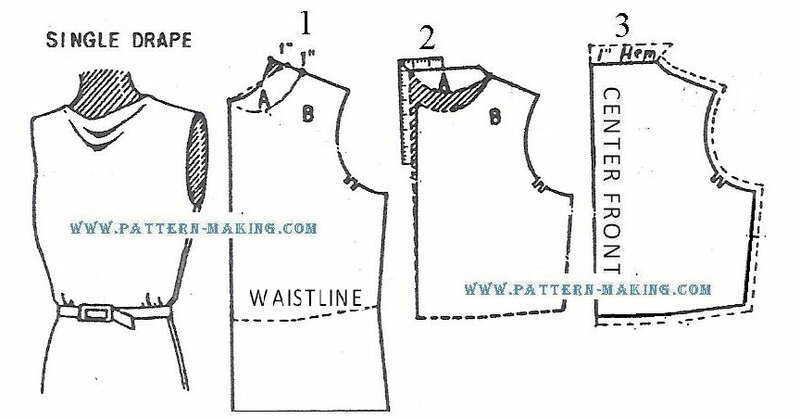 Illustration shows blouse with neckline 1” lower at shoulder, and 4” lower at center front. 1) Use the regular hip-length dress foundation as a guide. 2) Draw squared lines; then slash front between sections A, B and C, and spread placing front along the squared line as illustrated. 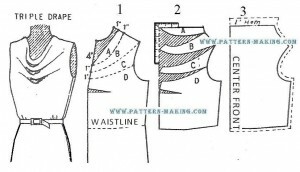 Trace front to waistline only. 3) For best results, front with cowl neck should be cut on the bias of material.